Firepaw, unable to hold it for longer, let the raccoon go. Before it could attack again, he'd clawed at its shoulders again. "Lightpaw, quick! It's nearly dead!" 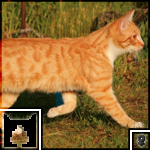 Firepaw used Front Paw Strike, doing 6 HP and costing 10 SP. Lightpaw nodded, his pale amber eyes glittering with determination, and swept in immediately after Firepaw had backed off. The raccoon lumbered to its feet, but too late, and Lightpaw had leaped onto its neck, sunk his claws into its shoulder, and sunk his teeth into its neck. The sodden creature let out a last pained cry before it stumbled and collapsed on its side, motionless. Lightpaw hopped nimbly away, shaking its blood from his whiskers. Its blood was bitter, and the apprentice wasn't certain that this sort of creature was meant to be eaten. Lightpaw used Killing Bite on Raccoon, doing 3 HP and costing 10 SP. Raccoon can no longer fight. Lightpaw asked Firepaw after assuring the creature was dead, "I've never seen one of those before. Do you know what they'e called?" ooc: Can we do just like a couple more posts of them grouping up with Mottledpaw and their prey and heading back to camp? 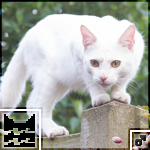 ic: Firepaw looked at it closely. "I mean, Flurryshine told me about these. They're raccoons and they generally stick around by Twoleg waste." His eyes shifted to the other hurt body. Mottledpaw. He trotted over by the tom, worried look on his face. He first nudged him and felt for a heartbeat- good, so he was alive. "Mottledpaw, are you okay?" He asked, hoping to Starclan for an answer. Lightpaw nodded and suddenly the name sounded familiar in his mind. "Raccoon," Lightpaw repeated as he examined it for a moment longer. "Yeah, Jaystar mentioned them, but we never saw one or crossed its scent trail before." Finally the young apprentice took a long, deep breath and turned away from the creature's body, back towards Mottledpaw who had fled several tail-lengths into the trees before collapsing beside a puddle. When Mottledpaw's muzzle was struck, he had seen stars and part of him had been convinced that the raccoon had clawed his face wide open and sent him right off to StarClan. Blindly he had fled, and stumbled to a halt beside a puddle. He pressed his nose, which was searing with pain, into it, trying to wash the filth of the creature's claws out of his wounds. Mottledpaw pulled his head out and laid his head down, numb with shock and fear, and his vision went black. Lightpaw followed Firepaw to his friend's side, also relieved to see the slight rise and fall of his chest. Mottledpaw was stirred what felt like only a heartbeat later, and he feared what he would see when he opened his eyes - whether it be StarClan or real life. However, he realized he had woken to a nudge, and the sound of his Clanmate Firepaw's voice made him lift his head suddenly. He tried to sound better than he felt, but his voice trembled as he replied, "I-I'm alive, at least. What was that?" "Raccoon," Lightpaw replied grimly, padding to his friend's side to help him stand. Lightpaw grimaced slightly at the sight of Mottledpaw's nose and muzzle, which had been clawed pretty violently by the lumbering creature. His friend's nose had been split right open, and Lightpaw realized how lucky Mottledpaw was to still have his eyes. With his friend's support, Mottledpaw stood, noting Lightpaw's pained expression at the sight of his injury. The tortoiseshell examined the other two apprentices, both relieved and humiliated to see that neither of them bore any battle wounds save for frayed claws and ruffled fur from fighting. Lightpaw seemed to read his mind. "It was just really bad luck," he mewed reassuringly, "I doubt it would have gotten you that badly if we had been prepared for it. We couldn't have known. It could have happened to any of us." Mottledpaw nodded but only said, "We need to fetch your prey, don't we?" Firepaw nodded. "Let's get you to Fallow(foot?)." He said, for once somberly. Lightpaw and Mottledpaw set off, with Mottledpaw leaning on his friend's shoulder more for emotional support than physical. His face felt like it was on fire from the scratches, and every little change to his facial expression sent a new small wave of pain through the new wounds. He tried to say nothing each time Lightpaw and Firepaw each stopped to collect the hare and robin that Firepaw had caught, even though his belly burned with shame. Lightpaw could say and do nothing to help Mottledpaw, so they walked back quietly. Once they neared camp, the white apprentice mewed, "Mottledpaw, why don't you go to the medicine cat's den? Fallowpaw will fix you right up, I'm sure." Wordlessly, Mottledpaw nodded and disappeared across the camp and into the den. Lightpaw accompanied Firepaw to the fresh-kill pile to drop off their catches, saying, "Thanks for helping take care of Mottledpaw, even though he's prickly to you. He'll warm up to you after this, I'd hope." Firepaw grinned. "They always do. How could they not, with me looking like this?" He struck a pose. Lightpaw laughed at Firepaw's smooth confidence and charm. He wondered how, after everything Mottledpaw had seen today, the tom could even begin to believe that being the son of a forbidden romance made him less worthy of being in RiverClan. The white tom hoped his friend would get over it soon. "Thanks for inviting us to hunt," he mewed, nudging the bold tom in a friendly way.